Outside of the buying frenzy with my pension rollover, things have been fairly quiet this month as I just haven’t been seeing the price points that I wanted on most of the holdings that I’ve been evaluating. 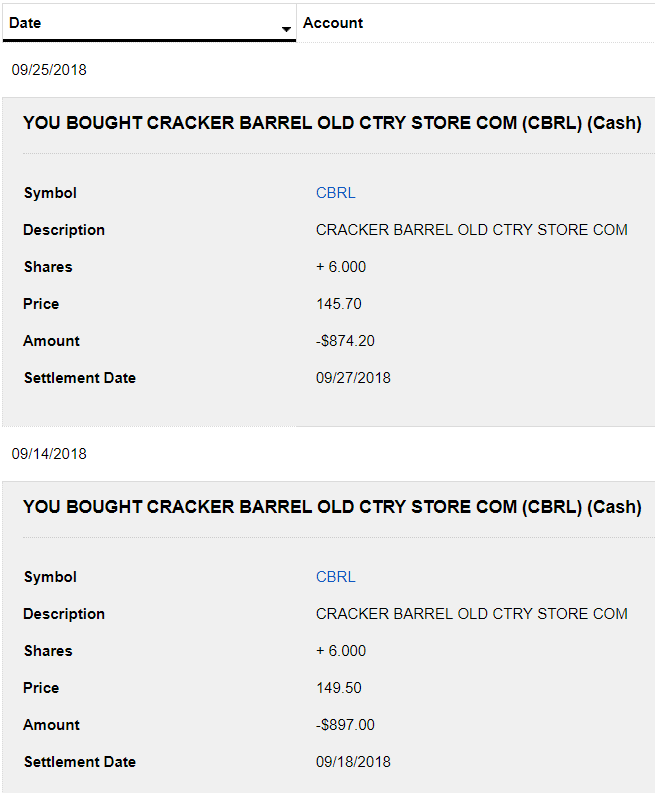 However, I was able to make two small purchases of Cracker Barrel–which you may recall was one of the companies on my September watch list. While I shared a bit of information about Cracker Barrel when discussing my watch list, it is worthwhile to share a bit more here and also touch on a few key points from their recent 4th quarter earnings announcement. Cracker Barrel Old Country Store, which was founded in 1969, has been a favorite of road travelers for many years–in large part because their ~650 stores across 45 states are often located right along the major highways to offer weary travelers a place for a nice home-style meal. In addition, their locations also feature a sizable gift shop that sells an assortment of items such as toys, apparel, candy, and various gift items. With regard to 4th quarter earnings, it was not a rosy picture as they missed estimates on both earnings and revenue for the first time in at least seven quarters. The decrease was driven by declining traffic as well as increased commodity costs, and they reported comparable store restaurant sales decreased by 0.4% with an average check increase of 3.1% but a 3.5% decrease in traffic. However, their retail component performed better with a 1.3% increase in comparable store sales driven primarily by women’s apparel, books, and stationary. Looking forward, the Cracker Barrel leadership team is awfully excited about the rollout of a new menu platform based on the bone-in fried chicken. And I mean really excited. They must have mentioned it close to 20 times during their earnings call. This new fried chicken initiative is part of their desire to focus on introducing new and craveable food, and their test rollout has received very positive feedback thus expediting their rollout to an additional 170 stores before Thanksgiving. The dividend growth from Cracker Barrel has certainly slowed over the last 2-3 years, with the recent increase of 4.2% lagging well behind their 5-year annual growth rate of 14.4%. Looking at that alone though is slightly deceiving, as Cracker Barrel has also been paying a special dividend annually for the last four years. This year that special dividend came in at $3.75/share–which adds a nice boost to the annual dividend. Including the special dividend, their dividend growth would have checked in at a modest 5.5% increase this year. 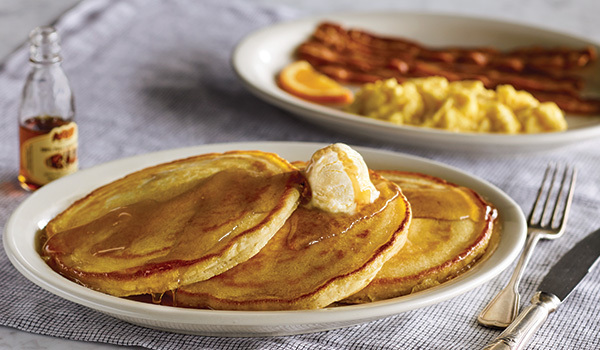 Cracker Barrel is a Dividend Contender with a 16-year history of increasing their dividend and maintains a reasonable payout ratio of approximately 52%–which is slightly lower than recent years. As mentioned earlier, I made two small purchases–unfortunately missing the nice dip after their earnings announcement as I was traveling for work and unable to keep an eye on the market. The additional 12 shares will add $60.00 in forward dividend income to my portfolio. Assuming that Cracker Barrel maintains their trend with the special dividend–which I will say that I am being cautious about given their Q4 earnings and notes about Q1 in 2019 being a little soft–that would add an additional $48.00 in forward income if they raised the special dividend by the same $0.25 as they have the last four years. While I am pleased that I have been able to add a few shares to one of the stocks on my September watch list, I will say that this month has been rather quiet as I just wasn’t seeing the great buying opportunities. With Cracker Barrel, I am comfortable taking small nibbles in this range below $150/share but for now I will likely hold tight with the ~22 shares that I have and see how management works through some of the challenges that were raised in their latest earnings call. On the bright side, the CBRL management team has done well over the years and therefore I am optimistic that they will achieve their targets moving forward. Over the last 8+ years, Cracker Barrel has been slightly better than the performance of the S&P 500 and while I expect they may continue to see some pressure, as long as they continue paying a respectable dividend–currently yielding 3.41%–I will be happy to hold. Have you ever eaten at a Cracker Barrel Old Country Store? What do you think of my purchase? Side note: It has been years since I have eaten their personally, but a memory that I will never forget is stopping there on our family road trips to Florida and sitting on the rocking chairs while we waited for our table–and of course getting a little toy as a souvenir as well. I think CBRL is a good buy as well. According to FAST Graphs, this is the cheapest valuation it’s traded at since early 2013, making the 3.44% yield plus the special dividends pretty attractive. What I like most about the company is the consistency of its performance. It’s had positive EPS growth in 14 of the last 15 years, with 2007 being the only negative growth year at -1%. Love that reliable growth! Appreciate your feedback Eric, as CBRL is one that doesn’t seem to get a lot of attention in the DGI community. You’re right about the EPS growth too, and not only has it been positive growth but most of those years it has been a very solid double-digit growth as well. It looks like next year will be close to flat but analysts are still expecting positive growth–and analysts have been quite accurate on CBRL. As you noted, I liked that the FAST Graphs data was supporting my analysis on the valuation to be adding in this range. Thanks for the note Tom, and looking at the Darden chart over the last 5 years does seem to show a pretty nice, steady climb upwards. Hindsight is always 20/20 though. I am having similar feelings on Brinker International right now as they did not raise their dividend on their normal schedule, so keeping a close eye on them. Interesting, I didn’t realize Cracker Barrel had as long of a dividend increase streak as they did. For some reason I was expecting something less than that. But their metrics are falling in line now that the price continues to fall. I may have to take a deeper look into this one now 🙂 Enjoy the extra income. I did find some conflicting information on their increase streak, as the CCC divvy stock list notes it at 16 years but I believe it was the new SA dividend information that said 8 years. Either way it’s a nice streak, and I’m looking forward to that continuing to grow moving forward. I’ll be interested to hear what you think if you take a deeper look at this one. Hope that bone-in fried chicken provides you a bone in extra special dividend! Nice job on the purchase. Haha, nice one Lanny! Appreciate the feedback. I’ve eaten at the restaurant once, some years ago. I recall it being a memorable experience. I think the closest one is about 2 hours away, making it more difficult to pop in unless we are traveling in the area. CBRL certainly has some predictable revenues and earnings. The beta on this stock is quite low… wow. Looks like the earnings forecasts for this year and next came down a good chunk after the last earnings report. It may be a bit before the stock climbs to the highs it set in January, but you get paid a nice dividend while you wait for that to occur. We have one about 30 minutes away, however it does seem as though it is more the kind of place that you stop while on a road trip–and that fact does influence their numbers as when there are less people traveling due to factors such as the cost of gas, they tend to see declines in their numbers. You’re right that next year is expected to be largely flat, with only about 1.3% EPS growth expected. They discussed that in their earnings call, particularly in reference to Q1 that they expect it to be down. Estimates for 2020 show a slight uptick to around 4+% EPS growth, so I’m not expecting any significant capital appreciation but will be pleased with the dividend (particularly if they continue paying the special dividend).